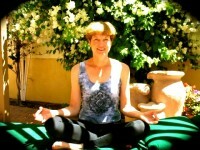 Beth Cook is a certified therapeutic yoga instructor whose goal is to give participants an hour of peace through yoga. Originally attending as a participant herself, she now enjoys teaching at the Cancer Support Center as well as leading retreats at the Center for Spiritual Renewal in Santa Barbara three times a year. Gentle Yoga with Beth is on Wednesdays from 4:30-5:30pm.